New York, NY, November 2, 2016- Millennials know the power of their vote and on election day they will disprove the popular narrative that they are disengaged by deciding who moves into the White House. 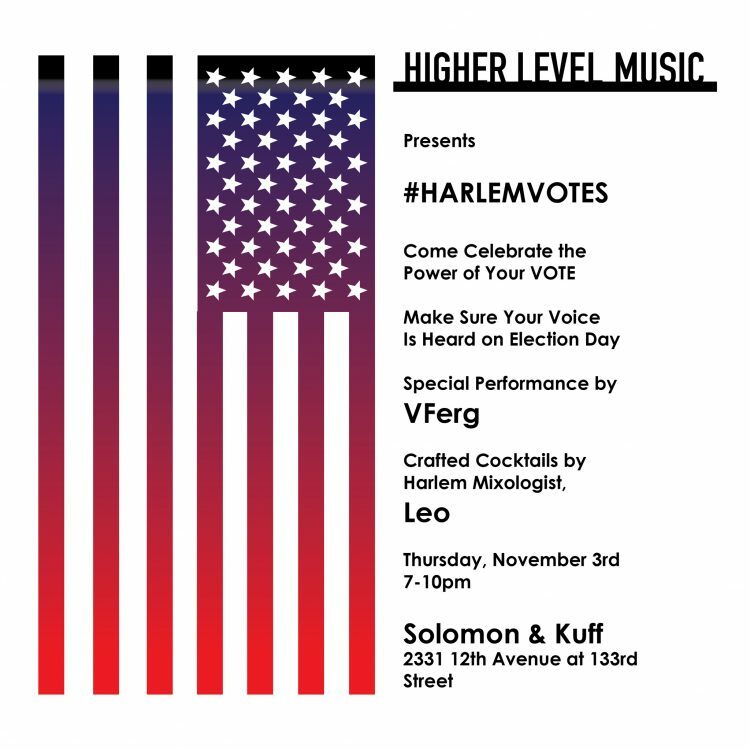 To reinforce voter turnout, recording artist/educator, VFerg will kick-off #HarlemVotes on Thursday, November 3rd from 7-10pm at Solomon & Kuff, 2331 12th Ave, New York, NY 10027. The free event will include a live performance by VFerg, an educator at a notable Harlem charter school and whose current single, “Birds of a Feather,” from his highly anticipated album, Higher Level Music, echoes the sentiment that those who want their voices heard will ban together. Additionally, Harlem mixologist, Leo will craft special drinks and cocktails to commemorate the occasion. “VFerg came up with the idea for #HarlemVotes in an effort to bring together influencers and to remind them that their friends, families, and communities are counting on their vote. He is motivated by organizations like Rock the Vote who have registered more than 1.5 million new voters and, the recent Rock The Vote/USA TODAY poll that shows that 83 percent of Millennials across the country are now registered. “ I know there is concern about whether voters under 35 are enthusiastic about the candidates and can be counted on to show up to the polls” says VFerg. “Harlem Votes is about reminding young people that voting is a responsibility and a way to have an impact on issues they care about. ‹ Higher Level Music EP is Out! Take a Listen. Tell a friend.